I found myself focusing on nothing else. I was a problem solver. I did things right. I was known for striving for perfection. Yet, I couldn’t win at this. I could not for the life of me win at (new) motherhood. I just didn’t know what to do. I didn’t understand what I had to do, or what my child needed. I felt like I was failing. That feeling of failure and confusion stuck with me. I couldn’t get out of it, and I began to fixate on it. I was trapped – and it helped foster the onset of my postpartum depression and anxiety. 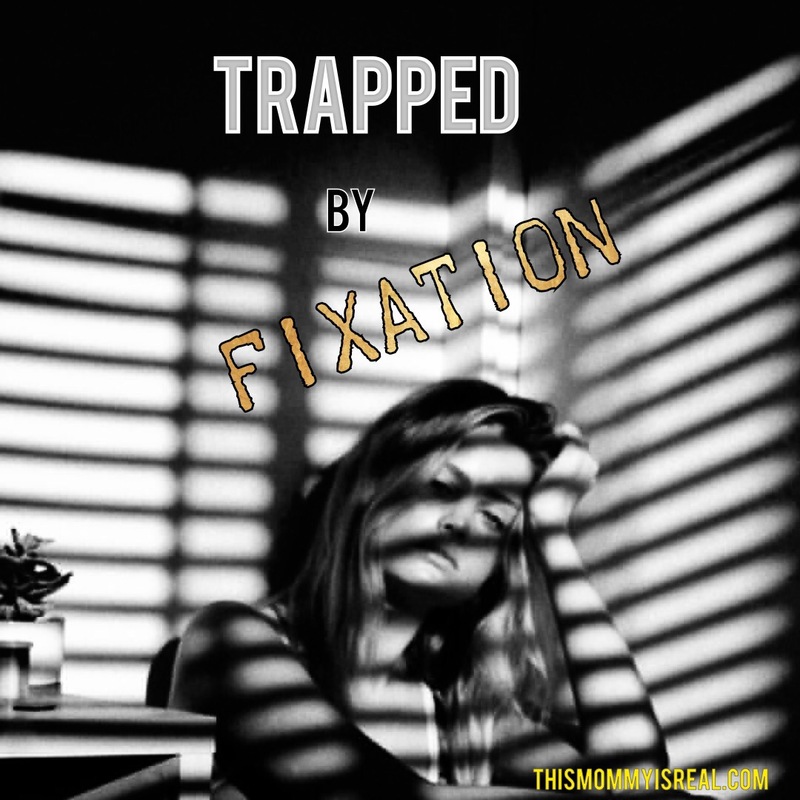 Truthfully, I have been trapped by fixation before. Whether it was a competition, a goal or a perceived failure, those feelings dictated my actions. Sometimes, it meant positive things – I was able to learn things quickly. I was determined to succeed. Other times, it meant something less positive. Often, it was bouts of self doubt and blame. I know I’m not the only one. Fixation takes place in different scenarios. It can affect adults and children alike. It can affect the most “normal” of people. For example, I know of a child that throws tantrums and gets very upset if they can’t get one thing that they want. No amount of time outs would help. The child would repeat the item over and over again, crying and pulling at his caregivers. Even after his desire for the item had waned, the fact that he did not get what he wanted when he wanted was enough to trigger him. A teammate once focused heavily on the negative aspects of the environment and community around us. So much so, it affected their mood and how they felt about their day. I saw the fixation in other PPD / PPA moms, who like me, could not forget what had happened in the past. As a result, they relived painful memories, and blamed themselves for things they could not control or change. It affected in such a way that they thought they were regressing. Change the scenery! Sometimes, staying in the same place just increases the intensity of what you’re feeling. Going to another room and just a short walk outside helped relieve things. Distract Yourself! When you get fixated, nothing else matters. That can be a problem. Teach yourself to let the issue go for a little bit. Do a different activity or think about more positive things to relieve the stress. Talk with Someone! Can’t seem to let it go? Confide in someone you trust and vent. Maybe it will help find the root cause of your fixation and how to work through it. Be open to suggestions on how to solve things or get through the situation. This is why therapy was so helpful to me. No judgments – just a chance to work through my issues. Relax! Meditate, go for a walk, read a book, etc. It’s another form of distraction, but one that focuses on being calm and getting rid of the stress and anxiety. Again, these are things that have worked for me. It changes with every situation, but I find comfort in the fact that I don’t have to be trapped. I found that I’ve gotten better over time, and things don’t bother much as much as they used it. If I happen to get fixated, the bouts don’t last very long, and I’m able to get out of them. I feel like I have more power in my well-being, and less stressed than I used to be. For any of you that have experienced the same type of fixation, what have you do to deal with it? Comment below with your suggestions! First I appreciate all your hard work as a mother, thank you! I can definitely agree that a change in scenery can do wonders. I have done this in the past and it improve my health physically and also mentally! These Are all great suggestions for dealing with postpartum depression and anxiety. I had postpartum depression with both of my babies and oh man is it tough. Changing the scenery is most helpful for me. Sometimes staring at the same thing puts me in a mood and I often take it out on everyone around me! One of my favorite ways to deal with a fixation is to cook. I generally try to make something that requires a lot of prep, because there is something about cutting veggies that always helps clear my head. Fixation is such a good word for everything you described in this post. I’m also always striving for perfection, even though I know it doesn’t exist! Sometimes, I think we just need to give ourselves a break and a pat on the back for trying so dang hard all the time! Thanks for the tips. Usually when I’m fixated on something it runs around in my mind for hours and days at a time. It is quite exhausting actually. I keep aiming to work on it but never do. I never realize how much changing the scenery does wonders for my mood and just overall inspiration. I also love listening to podcasts to either laugh or get listen to something on the lines of self help when I’m not able to motivate myself. You have the hardest job in the world, being a mom is hard work! I like what you said about talking to someone, it’s really important to not bottle up your feelings and fears! Hang in there. I’m glad you found some solutions to help you.